More vegans are adopting a raw diet. Just like a traditional vegan diet, a raw vegan diet eliminates products of animal origin. However, this diet excludes any type of cooking. Eating raw foods is believed to be healthier and natural, here is what you need to know about this lifestyle. What Does a Raw Vegan Diet Look Like? This diet includes a lot of fruits, vegetables, leafy greens, nuts and seeds. Foods are not cooked or steamed, although some people eat fermented foods and will warm up their food at a low temperature. Dehydration is often used to make fruits and vegetables last longer. The purpose of this diet is to get closer to the natural diet our ancestors ate. There are some benefits associated with eating a diet rich in fruits and vegetables and with eliminating processed foods from your diet. Finding sources of fats and proteins can be a challenge. This is why avocado, nuts and seeds are essential elements of raw diets. Legumes such as beans are among the most common vegan protein sources. Should You Adopt a Raw Diet? It is important to know that a lot of people go raw up to a certain percentage. They might eat up to 80 percent of raw food and follow a regular vegan diet the rest of the time, or even supplement their diet with some animal products. 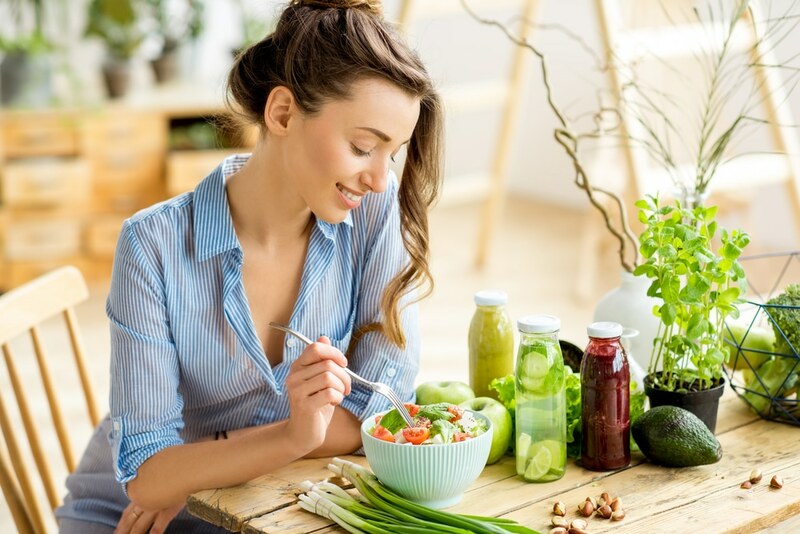 If you are new to veganism or have been thinking about adopting a raw diet, it is best to get started with small steps. You could try and have a raw day once a week, or eat raw lunches and still cook your dinners. Making an abrupt transition can be difficult. You should take the time to try some new foods, figure out how to adopt a balanced diet, and decide if going raw is right for you. There are many health benefits associated with vegan diets, including lowering your risks of developing some cancers, heart problems, and even diabetes. You may even lose weight as well. There are some claims that going raw is healthier because cooking foods damages some nutrients, however experts agree that cooking doesn’t completely remove nutritional value from foods.The downside of adopting a raw diet is that you may not be able to get all the vitamins and nutrients needed. You may have to take a multivitamin supplement. You should also know that eating raw foods for every meal requires a lot of planning. You could save time on meal prep, but will probably have to go shopping more regularly since you will be eating fresh fruits and vegetables. This aspect of a raw vegan diet can become easier with time. Here are a few raw vegan recipes you can try. You could integrate some of these dishes in your vegan diet, or use them to start transforming your diet and adopt a raw lifestyle. These recipes are also worth trying even if you don’t follow a vegan diet since they are rich in vitamins and nutrients. These healthy snacks will help you stay full between meals and give you energy. 2 slices raw flax bread. Use a fork to mash the ripe avocado into a paste. Spread the paste on the flax bread, and top it with a slice of tomato. You can season your avocado toast with salt, pepper, spices, or even sprinkle it with seeds. Olive oil, garlic, and even lemon juice will also add more flavor to this simple snack. 1 ½ cup almond milk. 1 scoop raw protein powder. All you have to do is put your ingredients in a blender and blend until you get a smoothie. You can top it with some seeds and try different flavors of protein powder for variety. There are plenty of raw vegan recipes for lunches you can prepare in advance and bring to work with you. Here are a few examples. Pizza crust: 1 red bell pepper, 1/3 cup sunflower seeds, 1/3 cup hemp seeds, 1/3 cup flax seeds. Cheese: 1 cup pine nuts, 1 garlic clove, 2 tbsp yeast, herbs. Sauce: ¾ cup chopped tomatoes, 1 tbsp miso, 1 garlic clove, herbs (basil or oregano). Toppings: your favorite fresh veggies, extra virgin olive oil. You will need to make the cheese in advance. Blend the pint nuts, garlic clove, yeast, herbs and add some water if needed. Let this thick mixture sit in the fridge under a cheesecloth for a couple of days. You can then make the pizza crust with a food processor. Blend the seeds and the bell pepper until you get a mixture with a dough-like consistency. Spread this mixture on a baking sheet and bake it at 115°F until it is dehydrated. Prepare the sauce while you dehydrate the crust. Use your food processor to blend the chopped tomatoes, miso, garlic and herbs. You can then spread the sauce and cheese on the pizza crust. Coat the veggies with the olive oil before adding them! ¾ cup nuts (almonds, peanuts, or cashews). Start by peeling the zucchinis and bell pepper into thin strips. Mix the zucchini, bell pepper, green onions, bean sprouts, and the nuts in a large bowl. Season with the cilantro, lime juice, and olive oil to taste. You can add more crushed nuts or any other vegetables you like. Here are a few dinner ideas to add to your collection of raw vegan recipes. Use your vegetable spiralizer to cut the zucchinis into thin noodles. Leave the noodles into a strainer in the fridge for half an hour. Mash the ripe avocado into a paste and use a food processor to mix it with the miso, garlic clove, basil leaves, and the olive oil. You can then coat the zucchini noodles with the avocado pesto, and add sliced tomatoes before serving. 3 cups peeled and chopped pumpkin. ¼ cup chopped white onion. Use a blender to mix the pumpkin, coconut cream, coconut water, onion, water, bell pepper, and the water together. You should get a mixture with a soup-like consistency after a couple of minutes. You can then add herbs and spices to taste. Raw chocolate is a delicious vegan snack, but you can prepare some amazing desserts with this ingredient. Start with the cake itself. Use your food processor to chop the pecans, and add a cup of dates. You can then add the cacao powder and one tablespoon of vanilla extract. Press this mixture into a cake pan and leave it in the fridge overnight. You can make the caramel sauce the next day. Blend the remaining dates, a tablespoon of vanilla extract, coconut oil, water, cinnamon and nutmeg together. Drizzle the caramel on the cake, and add more pecans, cinnamon, or nutmeg as toppings. Raw vegan is an option that is worth considering if you want to eliminate animal products from your diet. Make sure you will be able to eat a balanced diet and think about meeting with a nutritionist to talk about your options. Don’t hesitate to try some new recipes to find new foods you love if you are ready to adopt a raw lifestyle!